Tim Pawlenty talking during his campaign event. Republican presidential candidate Tim Pawlenty is back in his campaign R.V. today, headed to face-to-face meetings with voters in four different Iowa cities. Without naming his competitors, Pawlenty is stressing his experience as a two-term governor of Minnesota as a means of contrasting his record with the records of his rivals. “One of the points we’re trying to make with the great people of Iowa as they have this important role in being first in the country is to say before you fuel the rocket and launch is out of Iowa, make sure it can get all the way to the destination because the main way we’re going to goof up this election as Republicans is to nominate the wrong candidate,” Pawlenty said during a brief interview with reporters today in Ames. 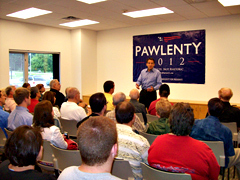 Pawlenty’s first stop of the day was in Ames, where more than 50 people gathered in a church to meet Pawlenty. Bob Anderson of Ames was convinced and even paraphrased the campaign’s new slogan. Leslie Saftig of Ames said she was “really impressed” with Pawlenty. Saftig, a former Minnesotan, describes herself as a conservative Republican. Saftig plans to attend the August 13th Straw Poll and she’s been attending candidate events in the area as part of what she calls her “due diligence” to find the right candidate for 2012.